Natural Astaxanthin; Free Radical Defense; *Joint pain relief; *Exercise recovery; Sun protection; *Enhance endurance. Need joint pain relief? Need to counter premature aging? Need to improve your stamina? Stazen Astaxanthin is one of the most powerful sources of antioxidants. A type of carotenoids, Beta-carotene is known to have anti carcinogenic properties due to their antioxidant effects. Research shows that not only does the body absorbs Stazen Astaxanthin better than any other carotenoids, but the compound actually delivers it antioxidant benefits directly to the brain, eyes and central nervous system, as well as the rest of the body. Unlike beta-carotene, it is able to cross the blood-brain barrier which is a membrane structure that acts primarily to protect the brain from chemicals in the blood while still allowing essential metabolic function. Astaxanthin is the defense force in your body that protects you from free radicals. It also provides you with an alternative from sunscreen as it protects the eyes and skin from UV A and B damage. It is also believed to increase strength and endurance, boost your immune system and protects your liver! Vitamin A (as Beta Carotene), Natural Vitamin E (d-alpha tocopherol), Natural Astaxanthin, Lutein, safflower oil, gelatin, glycerin, purified water. Free of: yeast, corn, wheat or soy Non-GMO, BSE-Free. STAZEN is a physician approved formulation of astaxanthin, nature's most powerful antioxidant, in a synergistic formula with natural Vitamin E.
STAZEN is a powerful tool for today's active lifestyle. STAZEN is produced naturally from cultured microalgae. "It has improved my major joints making them stronger and less pain and aches. As sometimes I was under the sun I can feel that my skin is less prone to sunburns and that my health as definitely improve. 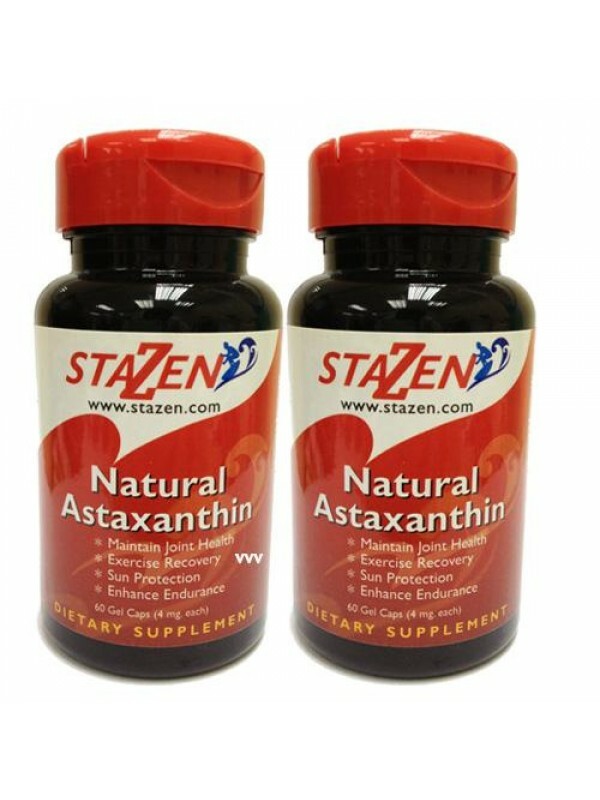 I would definitely continue to purchase Stazen Astaxanthin from stores that sell and also recommend to my family members, colleagues and friends on the effectiveness it has on me. Thank you Stazen!" "After taking Stazen Astaxanthin I feel that my joints are much better than before. I feel more healthy and move around especially when climbing up staircase. I can squat easily and not having pain on the knee cap. I noticed that after my exercise in the morning there is not much joint pain as before." "Before supplementing on Stazen Astaxanthin, I sued to feel lethargic and get tired easily. After consuming Stazen Astaxanthin, I have started to feel less tired and more energetic. Furthermore, I also experience better sleep. Aside from this, the pain in my joints has reduced as compared to before. I started supplementing on Stazen Astaxanthin has definitely benefited me greatly and I would recommend to others without any question." Leave us a question about this product and we will email you the answer.